As a busy mom of three boys, I’m always on the lookout for dinner inspiration. I’m looking for affordable, delicious, wholesome meal ideas that don’t require any ingredients I can’t find in my rural community’s grocery stores. 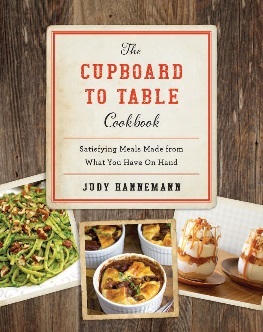 So when I was given the chance to get a sneak peak at Judy Hannemann’s new cookbook, The Cupboard To Table Cookbook, I jumped at it. Hannemann is the woman behind The Midnight Baker, the popular blog dedicated to easy main meal and dessert recipes that can be made in 30 minutes. She is also the author of The Classic Slow Cooker. The Cupboard To Table Cookbook is written for folks who are looking for quick solutions for dinner. It contains more than 100 recipes for everything from appetizers and drinks to hearty meals and delicious desserts. The cookbook also includes a comprehensive list of grocery staples to keep in your pantry, fridge and freezer. Hannemann has created an absolutely gorgeous cookbook filled with recipes that will appeal to both foodies and families. Most of the recipes are easily scalable – meaning you could adapt them for your party of two or your next potluck relatively easily. The recipes look amazing and sound delicious. From Asian Chicken Thighs to Bacon Cheese Pull-Aparts to Chocolate Almond Cheesecake Parfait there is something for everyone in this collection. The recipes are simple to follow with common ingredients. My only real criticism of this cookbook is that while Hannemann does provide a great list of grocery staples to keep on hand, there’s no real guidance on ways to stockpile those items. If you’re looking for those kinds of money-saving tips, The $5 Dinner Mom Cookbook by Erin Chase is a better option. I’m also a little disappointed that a few of the recipes use heavily processed ingredients like refrigerated biscuits or pre-made mixes. I would have liked to see some recipes for homemade versions of those items included, like Alea Milham’s recently published Prep-Ahead Meals From Scratch does. These criticisms are very minor and should not discourage you from picking up The Cupboard to Table Cookbook. It is a beautiful cookbook with some delicious recipes that will certainly inspire you to keep your cupboards stockpiled with the ingredients needed to make these quick meals. The recipes are really the star of The Cupboard to Table Cookbook, and it would make a great addition to your collection. It would also make an excellent gift for Mother’s Day or to bless a new bride. While The Countryman Press did provide me with a review copy of this book, the opinions expressed here are 100 percent my own and were not edited by the publisher, author(s), or their affiliates. This post also contains affiliate links which help support this blog at no additional cost to you. Please read my full disclosure policy for more information.